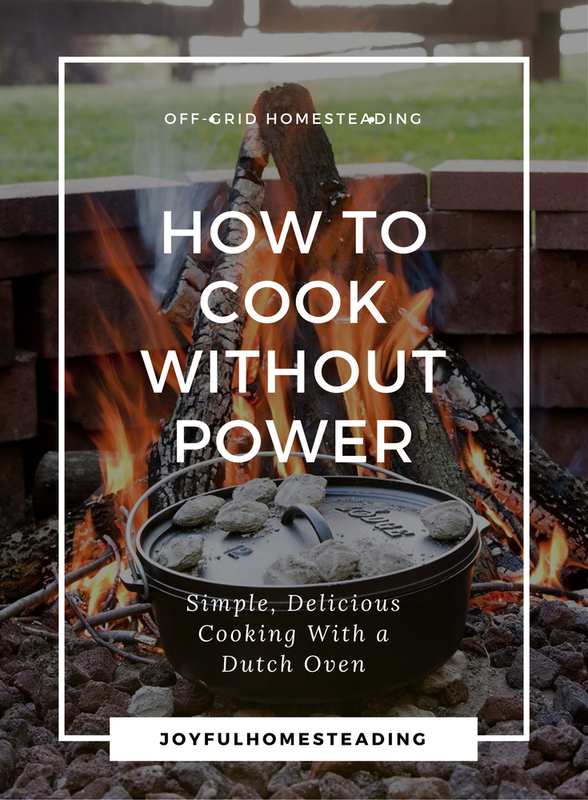 Cast iron Dutch oven recipes, along with a cast iron Dutch oven, are essentials to have on hand should the power go off. But they're also useful if you're moving toward an off-the-grid lifestyle, or if you are simply looking for ways to keep your house cooler in the summer. These are turbulent days we are living in, and it's wise to be prepared. While we may not be struck by an EMP, the collapse of the dollar very well may happen, and although we should not live in fear, preparing for an emergency can avoid needless suffering and trauma and provide you with peace of mind. Camp Dutch Oven Photo courtesy of Amazon. 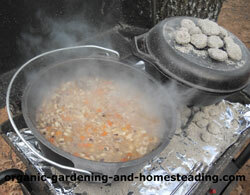 So learning to cook outdoors is not only a great idea, it's essential for self-sufficient living. And there is no group out there who are greater masters of outdoor cooking than the Boy Scouts. Their motto is "Be Prepared", and they are certainly prepared when it comes to outdoor cooking and cast iron Dutch oven recipes. Unlike cooking with a solar oven, which takes a lot of time and practice, cooking outdoors with cast iron cookware is much easier and faster. And the food was amazing. I have never made such moist cornbread, and the soup cooked up really quickly. 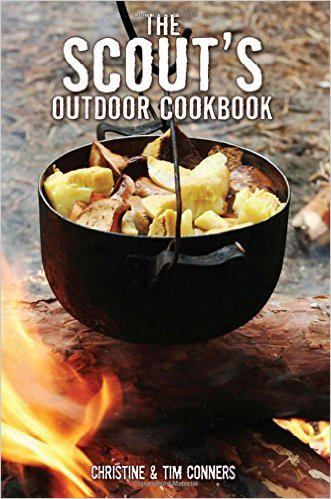 My favorite collection of cast iron Dutch oven recipes is The Scout's Outdoor Cookbook by Christine and Tim Conners. Not only does it have a lot of great recipes, but it also has essential information on how many charcoal briquettes you need to reach a certain cooking temperature as well as ratings on recipes from easy to moderate to more difficult. My favorite Dutch Oven cookbook. Lodge has a very good, reasonably priced Dutch Oven. Find one here. 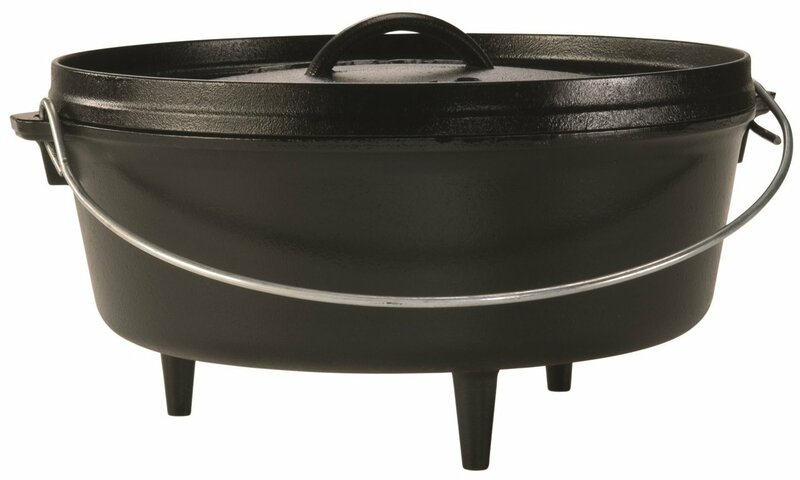 Obviously cast iron cookware and especially a camp Dutch oven is an excellent choice for preparing your cast iron Dutch oven recipes. Lodge has a very good, reasonably priced Dutch oven. You can also use a cast iron combo cooker such as this one, although you will also need a lid stand (you can see one here) to lift the cookware up so you can set coals underneath. A Dutch oven lid lifter (see one here) is also very handy to have. You will also need charcoal briquettes. While you can use wood coals, briquettes are easier to light and make for more accurate cooking. Plus they're inexpensive especially if you buy them in bulk, so consider adding two or three bags of these to your disaster preparedness list. Plus, a charcoal briquette starter is essential. (You can see one here). They don't cost much and they are very easy to use and eliminate the need for toxic charcoal fluid lighter. Just pack crumpled paper in the bottom of the starter and place the charcoal briquettes on top. Light the paper, and the briquettes will be going in less than 10 minutes. Ready to start cooking? This recipe is easy to make and like all the recipes in this book is very, very good. Cut the pork into 1-inch cubes. Then blend the flour, chili pepper, salt, oregano and garlic powder into a large mixing bowl. Add the pork to the flour mix and coat well. Place 15 briquettes under your Dutch oven and melt the lard. Add the floured meat mixture and fry it, stirring occasionally until the pork is cooked through and tender, about 30-40 minutes depending on how hot your coals are. Don't let a hard crust form over the carnitas. This recipe serves 10-12 people. Serve with tortillas refried beans, salsa and sour cream. Yes, breads can also be a part of your cast iron Dutch oven recipes. Here's my cornbread recipe. Grease the bottom and sides of your Dutch oven. Mix together the dry ingredients and then in a large measuring cup, mix together the milk, egg and oil. Add the liquid ingredients to the dry ingredients and pour into your greased Dutch oven. 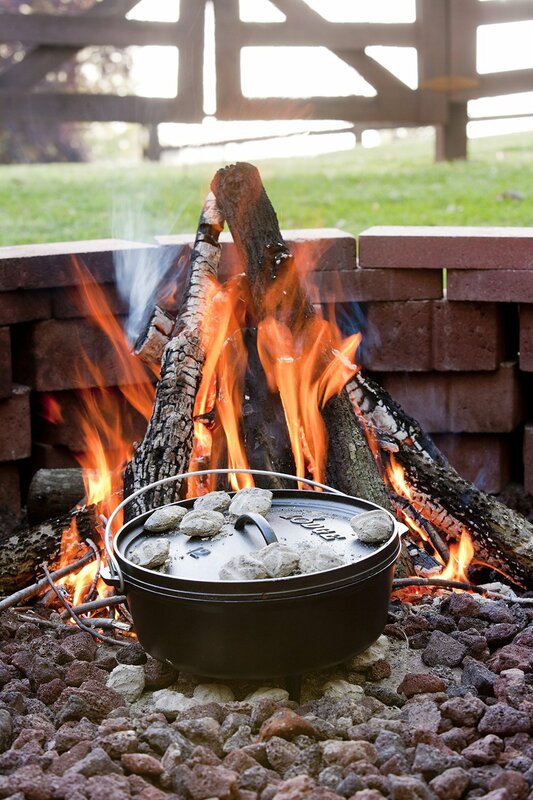 Place the Dutch oven on 17 lit coals and then cover with an additional eight coals. Bake for about 45 minutes or until a knife inserted in the center comes out clean. This recipe serves six to eight people.